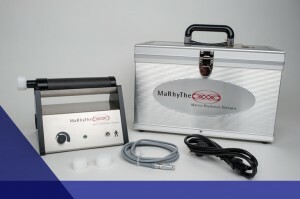 Matrix-Rhythm-Therapy is applied through the the Matrixmobil® device. The device is the result of long-term scientific research and extensive practical experience. Nevertheless, it remains a fairly uncomplicated medical device. The Matrixmobil® is TGA approved and registered according to European Union Council Direktive 93/42/EEC, as amended by 2007/47/EC, and is classified as a Class IIa product. It is ergonomically designed and easy to handle. Each qualified user will quickly become a successful therapist and will swiftly be able to make progress in treatment. The Matrixmobil® consists of the control unit and the manual applicator. All parts are sturdy and of high quality. A distinctive feature is the purpose-built resonator; its form enables the harmonising effect of rhythmic vibrations on the body. This resonator guarantees a sensitive modulating adaptation of vibrations towards the tissue so that the risk of ligament hyper-extension and resonance harm of inner organs can principally be eliminated. The resonator is made of hypoallergenic material and is very comfortable on the skin. The Matrixmobil® is portable so that it can easily be taken along and used wherever necessary. In just a few simple steps, it is ready to operate and thereafter can be put back in the carry case. The Matrixmobil® is a sturdy device that is constructed for long-term professional use. The materials – consistently primarily stainless steel, titanium and skin friendly plastics – are of high quality and markedly resilient. For the treatment of patients with cardiac pacemakers, there is another resonator without magnets. There are also some accessories such as a shoulder bag or carrying case that complete the Matrixmobil® system. The tool operates with the common mains voltage. A precondition for the device purchase is participating in a one-day introductory workshop. On the one hand, we fulfill our legal obligation to explain the device’s operating mode to our new customers . On the other hand, we will teach you the most important basics of the matrix concept, Matrix-Therapy and hands-on practical application with the Matrixmobil®. This training has been found to be very important and valuable for day-to-day use of your new equipment. You can expect a workshop in a pleasant and sophisticated environment! Apart from that, you will be offered a source of inspiration concerning the latest results from research and evidence-based background information. If you are interested in a workshop, you can find more information here. If your Matrixmobil® doesn’t work properly, our service department will promptly deliver replacement devices and repair your instrument at a fair price.